Forty years ago humans embarked on a dangerous journey from which their safety and return could not be guaranteed. Not since humans first journeyed far from the savannahs of Africa or set sail across vast oceans has any trip been so defining of the spirit that lives in all of us. We are seekers of knowledge, of new frontiers, we are restless spirits and explorers always seeking to chart the unknown in the quest for understanding what lies beyond our shores. Today we remember and celebrate not just an era when giant rockets and giant men ventured across the stars to set foot on another world, but when we as humans dared to leave the safety of our shores and fulfill our destiny as explorers - to reach out and quench that thirst for knowledge by not just dreaming, but by turning our fears into courage, our dreams into words and our words into action. 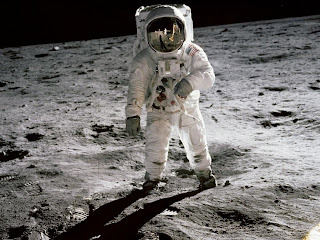 We remember the words of Neil Armstrong as he stepped on to the surface of the moon “One small step for man, one giant leap for mankind” and later “Here men from the planet earth first set foot on the moon – we came in peace”. Only five hundred of us have ever left planet earth to venture into space. Just twenty-eight of the billions of us have ever left the confines of low-earth orbit earth to venture to the moon and only twelve of us have walked on its surface, but it is not the number of us that made the journey that was important. What was important was that we decided to go at all - for in the end it was not just twelve men who made the journey, but a civilization that made that journey with them. On this day, we mark that great adventure and the skill, courage and bravery of all who made that journey possible. Many are no longer with us, but their spirit and their commitment live on. The fruits of their work shall sit for an eternity on the surface of the moon and will survive long after the humans that built it or remember it will walk the face of the earth. It will live on as a monument to an era when risk, daring and a strong national will defined the human spirit. We can only hope that the spirit of that time is not lost on future generations. Our spirit and our drive to seek out new frontiers cannot be silenced by those who think exploration too risky or too costly. Hundreds have paid the ultimate price for the dream of space exploration. Perhaps millions over the existence of humankind have done the same to move us forward off the plains and off the shores to a bold new world over the horizon. Today, we also remember the small steps of our ancestors that made “a giant leap” possible.